This pattern is so easy to do you end up with a scarf that is diagonal and very soft and lacy. I used 7mm needles as I wanted the pattern to be very open and light it also means it knits up very quickly as well. The yarn I used is DK but any yarn will do adjust the size of the needles to about 2 to 3 sizes larger than stated for the yarn weight if you want an open effect. I said it was easy didn't I and it is. I used two colours alternating every second row I that way I did not have to cut off the yarn and tie it in again. 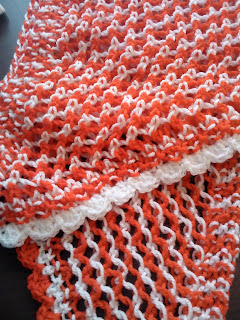 You can add tassels to the ends or a crochet edging, I used a shell crochet edging as I thought it would look nice. I used a white yarn to make the shell edge on one end and a red yarn for the shell edge on the other end. The result is a soft light scarf that looks more complex than it really is. I had this pattern written down in my little book and cannot recall where I found it as I did not record that information at the time. Thanks for the pattern. I will definitely knit this one. I like the way you used 2 colours without having to sew in the ends.